Mt. Major is the easternmost peak in the Belknap Range, and also the closest to Lake Winnipesaukee. Its panoramic view of Lake Winnipesaukee is one of the best, and it is accessible via a very short, though steep and rocky, hike. The Mt. Major Trail begins in the northwest corner of the parking area; it is to the right of Brook Trail. The trail starts as a wide dirt path running along the base of the mountain. It begins climbing initially, but flattens out after awhile, reaching a junction in 0.7 miles. Turn left, uphill, onto Mt. Major Trail as Brook Trail continues ahead on the wide road. The trail quickly becomes steep and rocky. After a steep, ledgy, half-mile climb, the trail forks. The right fork (the main trail) negotiates several steep rock scrambles, while the left fork (Ledge Detour) avoids them. Both paths rejoin after 0.1 miles. The trail soon emerges from the forest and onto open rock, where views appear. The summit is reached in 0.1 miles. From the summit, there are very wide and close-up views of Lake Winnipesaukee. To the east are Copple Crown Mountain and the Moose Mountains. To the north is the circular Ossipee Range. The Sandwich Range of the White Mountains is a prominent feature across the lake to the left of the Ossipees. The smaller Squam Range also occupies a portion of the scene further to the left. To the west, the distant view is blocked by nearby Straightback Mountain and Quarry Mountain. Belknap Mountain, the highpoint of the range, pokes out between these two. The area around the summit itself is fairly large and provides many places to sit and enjoy the view; one spot on the southeast side provides a particularly nice view of Alton Bay. The remains of an old fire lookout stands at the highest point. To descend from Mt. Major and complete the loop, find the top of the Boulder Loop Trail, to the south of the Mt. Major Trail. Follow this trail across the southern ledges and past a small bog before entering the forest. For the first 0.4 miles from the summit, the trail descends at a pleasant grade, crossing more ledges in the forest. After this section, the trail makes a zig-zag, then drops over a very steep and rocky pitch toward the namesake of the trail, an extensive area of the forest with scattered boulders. 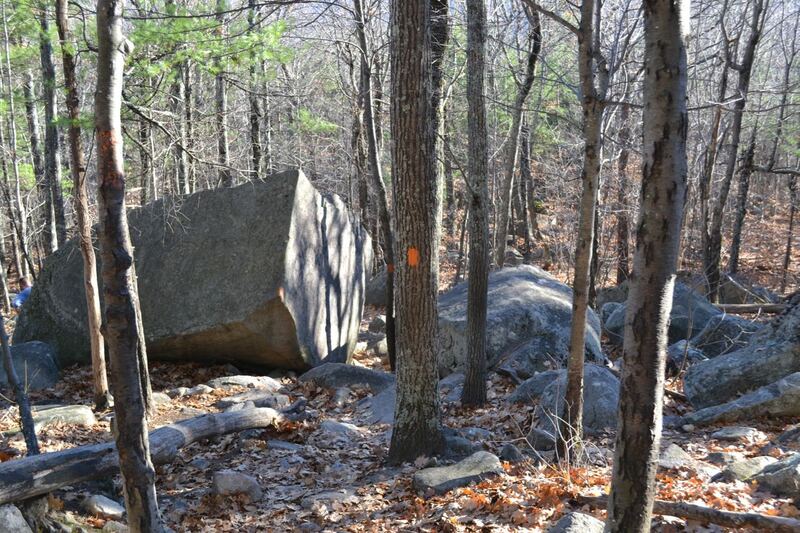 After 0.2 miles, the steepest part is over, as the trail weaves through boulders and over large, flat rocks. In another 0.3 miles, the descent is mostly over as the trail swings left to join a woods road. In 0.3 more miles, it makes a right turn downhill, then turns left as the trail junctions with Jesus Valley-Beaver Pond Trail. From here, the woods road continues 0.4 miles to the parking area.